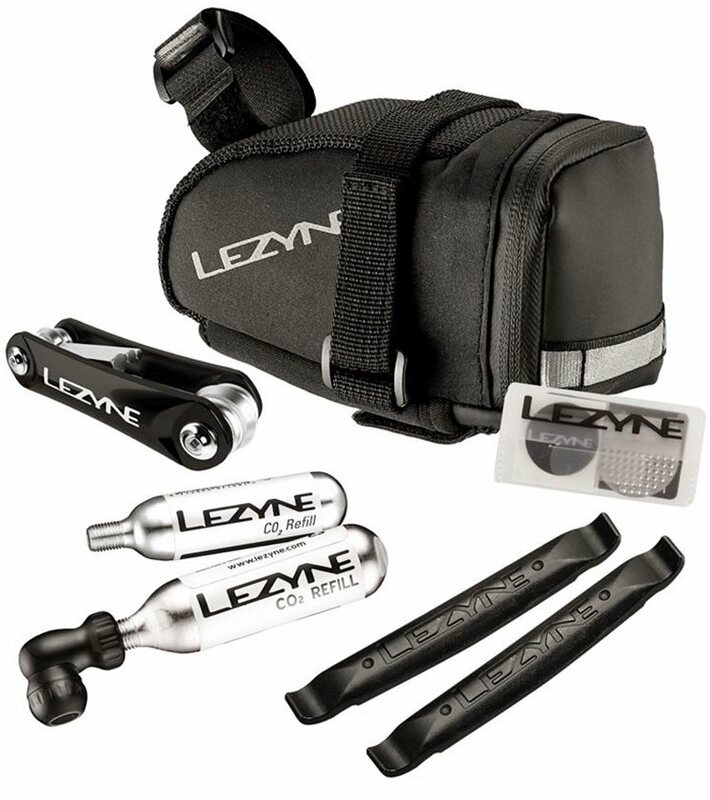 The Lezyne M-Caddy C02 Repair Kit includes an M-Caddy Saddle Bag and everything that should be inside of it to send you on your way. With Velcro straps that attach to the saddle rails and seat post, your M-Caddy seat bag isn't going anywhere. The water resistant zipper helps to fend off the elements, while the tail light loop conveniently located on the saddle bag allows you to attach a tail light. The main compartment features neoprene pockets that help you to organize your flat repair tools, money, and ID. The external multi- tool compartment, makes grabbing your Rap-6 multi- tool easy and fast. The Lezyne twin speed drive is CNC'd from durable 6061 T6 aluminum for a maximum strength to weight ratio. The twin head is compatible with both Presta and Schrader valves, making the twin drive super versatile. A simple threaded valve operation allows for simple inflation, while the inflator head has "O" rings that can be replaced when needed. The twin speed drive co2 inflator is only compatible with threaded co2 cartridges. Two 16g C02 cartridges are included. The Rap-6 features stamped aluminum side plates that are lightweight and low profile. The forged and drawn CRV bits are nickel plated for durability. Wrapped Center Pivot bits increase tool rigidity and improve ergonomics. Cast steel chain breaker works with 8/9/10/11 speed chains (RAP 14 and 20) and has 3 integrated spoke wrenches. The Rap-6 includes 3- 6mm hex, Phillips, and star T25. Glueless patch kit that includes 6 patches, 1 tire boot, and a stainless steel scuffer. comes with quality parts but a bit smaller than i thought which i actually like because its less noticeable and more hidden. Looks great! The Bag is REALLY small. I bought this to hold tools, cellphone, and keys. I didn't need a big bag, just got smaller than was useful. The tools are plastic (plastic walls on the multi-tool, plastic levers), but I had to use the levers right after I got them on a road bike, and they seemed to work. Not sure if they'd hold up to a significant workload though. I would only recommend this to someone who may need a fix it kit for a single use. Would recommend getting something stronger for long-term use.